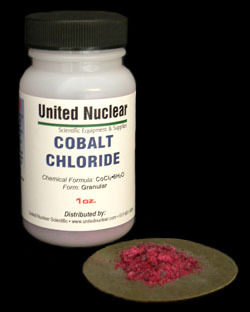 The most well known use for Cobalt Chloride is an experiment done by most grade-school teachers. Filter paper is dipped into a Cobalt Chloride solution and allowed to dry. Once dry, the paper is blue in color, but when the air becomes humid ( as before an approaching storm ) the paper will turn pink. It's basically a humidity detector. When the paper dries out again, it returns to its blue color. The process can be repeated indefinitely. A very tiny amount goes a long way. Note: Cobalt Chloride is a chemical that is used in blood doping for Horses and recently Humans. We do not allow our chemicals to be used for this purpose. For this reason, quantities are limited to 1 ounce. If you need larger quantities, please contact us.